If the personal, country-hopping saga of Edward Snowden is the sideshow to his NSA revelations and the ensuing privacy debate, then the reemergence of Julian Assange and WikiLeaks as newsworthy topics is the sideshow to the sideshow. Which isn’t to say the group hasn’t made an impact on the story: While Assange’s initial attempts to align himself with Snowden reeked of publicity-fiending desperation, the organization did reportedly assist the NSA leaker with his trip from Hong Kong to Moscow and is working with Assange’s friends in Ecuador in hopes of earning Snowden asylum there. And they’re making sure everyone knows it. But a comeback is occurring nonetheless, if more as an international network than a rogue publisher. “As an act of international, quasi-diplomatic intrigue, it’s impressive,” one expert in government secrecy told the Times. “It’s an extraordinary turn of events.” WikiLeaks, always game to play with the mainstream press, knows how to stoke the flame. In multiple conference calls with reporters since the Snowden story started, the group has teased its expanded involvement moving forward, including possibly publishing more of Snowden’s leaks, but skirted most specifics. “WikiLeaks has successfully inserted themselves into the story by doing what seems to be an impressive job of lending support to Snowden’s ability to get out of Hong Kong,” Guardian reporter Glenn Greenwald, who published the initial NSA leaks, told BuzzFeed. “The kind of publication that WikiLeaks has done in the past is not as I understand it what Snowden wants for the documents. He could have gone to WikiLeaks in the first place if he’d wanted that.” But now that Snowden is in the fold, anything can happen. 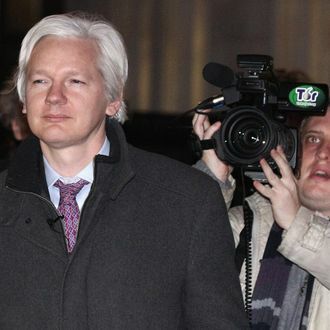 And even if nothing more comes of it, eyes are at least on Assange again.